2018 Undergraduate Research Scholars Symposium – Let Us LAUNCH "U" into Research! On February 28, 2018, LAUNCH: Undergraduate Research held its first ever Undergraduate Research Scholars Symposium in the Memorial Student Center on the campus of Texas A&M University. This Symposium showcased undergraduate researchers in the LAUNCH Undergraduate Research Scholars (URS) thesis program. The Undergraduate Research Scholars (URS) thesis program provides undergraduates with a graduate student experience by allowing them to participate in research, produce a professional document, and communicate their findings as principal authors to the University’s scholarly community. The 120 students from the TAMU College Station Campus represented nearly all colleges on campus. 116 students from LAUNCH: Learning Communities attended oral and poster sessions as audience members. Over 300 students from LAUNCH: Honors attended oral and poster sessions as audience members. 41 faculty members and postdocs volunteered as active listeners for oral and poster presentations by undergraduate students. 22 members from the LAUNCH office and the LAUNCH Undergraduate Research Ambassadors program volunteered to help run the event. LAUNCH: Undergraduate Research at Texas A&M University, College Station, aims to strengthen the visibility of undergraduate research in Texas with our counterparts at The University of Texas at Austin. The new Academy of Undergraduate Researchers Across Texas—a community of elite student researchers at our two flagship universities—provides these exceptional students with networking opportunities, the chance to hone their professional skills, and a venue to discuss the importance of undergraduate research and the impact it has on their lives. The LAUNCH URS Symposium is free and open to the public. 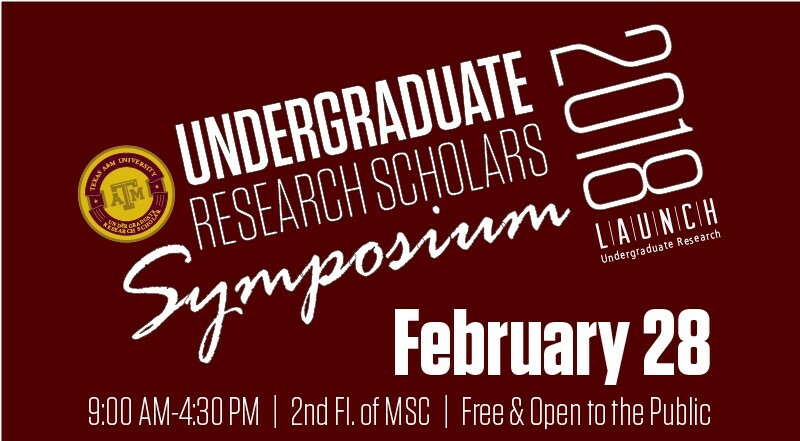 Undergraduate students from all disciplines are encouraged to attend the LAUNCH URS Symposium to learn more about how to get involved in research at Texas A&M University. LAUNCH URS Symposium also fulfills the URS thesis program requirement for students to do a public presentation and also offers them a chance to receive constructive feedback on their research projects and presentation skills. The LAUNCH URS Symposium features both poster and oral presentations by undergraduate researchers in a variety of disciplines. Both oral and poster presentations were attended by faculty, staff, post-docs, and graduate students invited to attend as active listeners and provide feedback on research projects and presentation skills. Undergraduate students in LAUNCH: Honors and LAUNCH: Learning Communities programs will visit presentations and will be assigned reflection activities to help them discover their own research interests and develop their communication skills. Volunteers for the LAUNCH URS Symposium will include the LAUNCH Undergraduate Research Ambassadors, Learning Communities’ Peer Mentors, and LAUNCH staff members. The inaugural meeting of the Academy of Undergraduate Researchers Across Texas coincided with the LAUNCH Undergraduate Research Scholars (URS) Symposium. A personal tour for our guests from the University of Texas at Austin, hosted by the LAUNCH Undergraduate Research Ambassadors. Included a special presentation on National Fellowships presented by Benjamin Simington, Program Assistant for National Fellowships, LAUNCH. LAUNCH: Undergraduate Research provided an opportunity to meet with an elite group of undergraduate researchers from Texas A&M’s College Station, Qatar, and Galveston campuses, as well as students from The University of Texas at Austin. Students learned about the cutting-edge research being conducted at the two flagship institutions in Texas. Taif Mohamed (left) and Shaika Al-Qahtani (right) presenting at the URS Symposium, 2018. Taif and Shaika are students from Texas A&M University, Qatar campus. Claye Epperson presenting at the URS Symposium, 2018. Claye is the first student piloting a collaboration among LAUNCH: Undergraduate Research, the Department of History, and the TAMU School of Law. Cora Drozd presenting at the URS Symposium, 2018. Cora is the first student piloting a collaboration between LAUNCH: Undergraduate Research and Philosophy for Children Texas.